This was how a woman recently explained the culture of the company in which she works. 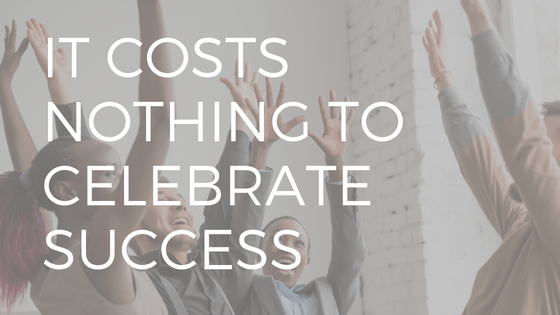 The idea of taking time to celebrate success is basically unheard of. She went on to tell me that in her 11 years with this organization she has never once seen or heard a single word of praise or recognition directed at the success of either herself or her coworkers. Culture is a word that is freely bandied about in many organizations and I have come to believe that it simply means this is what is normal around here, or this is what is acceptable around here. I had been hired to do an assessment of the culture of this company and had met privately with every individual to ascertain the prevailing sense of what folks considered to be normal behaviour. Her comment to me was not unlike others I’d heard in many organizations and it always surprises me how much time is spent catching people doing things wrong and how little time is focused on catching people doing things right. When I have questioned this, the response has often been that when people do things well, they’re simply doing what is expected of them and therefore there is no need to celebrate success, but when people do things less than well, this needs to be harshly brought to their attention immediately so as to rectify their performance. As a consultant I have had the privilege of working in numerous different organizations, across many different industries, with a vast array of different leaders and managers and if there is one thing I have witnessed repeatedly it is that behaviours that are awarded, are repeated which means, in my opinion, it is the role of a leader to look for opportunities to celebrate success because by so doing, they are setting the tone for future successes to be celebrated. It is fascinating to me, when watching sports, to see the team celebrate success each time goals are scored, and points are earned. Each of these occasions is an instant trigger for outward expression of celebration involving all the players and those moments inspire every member of the team to try even harder to create the occasion for the next celebration. It is puzzling that many organizations have a culture that is unable to see the huge benefits of taking time to celebrate success, recognizing stellar performance and always seeking opportunities to lavish praise. The cost is zero, the return potentially enormous. Conversely, the cost of treating victories as nothing more than expected happenings, and viewing good performance as someone simply doing what they are paid to do, is potentially devastating. In my company we have conducted thousands of exit interviews with departing employees and the vast majority of the folks we interview tell us the primary reason for leaving their company is because they did not feel valued or appreciated for their efforts. And can you honestly say that when you receive sincere recognition and thanks for a job well done you do not feel spurred on to do it again? What gets rewarded gets repeated, what gets ignored gets resented. Couldn’t possibly be simpler than that.